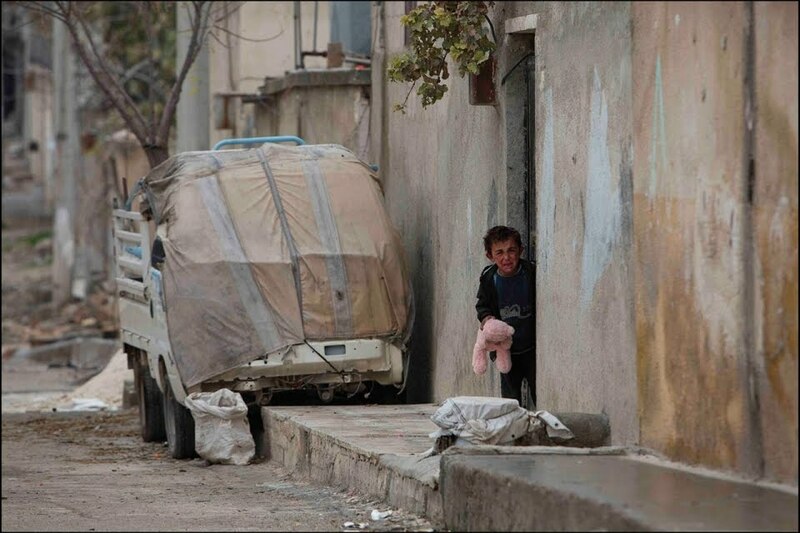 A young Syrian-Kurdish boy in Kobane cries for his parents from within a dead, destroyed city. Right now Europe and much of the world are in the midst of the greatest refugee crisis in recorded history. Millions of men, women, and children fleeing wars, persecution, and other forms of violence are fleeing by land, sea, and air and seeking out a better life elsewhere. Sometimes this is temporary, other times more permanent. It is my hope that reading this will help establish a base knowledge and understanding for the reader as to why and how so many people are fleeing their homes, and to put into perspective the true nature of human suffering being endured by so many right now. Over five years ago a revolution, which became a civil war, began in Syria, in the southern town of Dara’a. The war has been characterized by its widespread use of extremely destructive weapons, including rudimentary barrel bombs, traditional air-delivered ordinance (including cluster and incendiary munitions), artillery, and chemical weapons. Such are the levels of destruction in Syria that many cities look like modern-day recreations of Stalingrad or Berlin circa 1945. In addition to widespread destruction, the war has also seen deliberate targeting of civilians and civilian infrastructure, mostly by government forces. Hospitals, schools, civil defense stations and water pumping plants are routinely targeted, as are marketplaces, mosques, and power generation facilities. Several cities are currently besieged, either by government forces, opposition fighters, or Daesh (ISIS/ISIL/IS). Some of these sieges have been ongoing for years now, with little hope for those trapped in the cities. In opposition-held areas, Russian and Syrian air force aircraft constantly circle overhead, waiting to pick off any vehicle foolish enough to attempt to make deliveries to the cities. In areas besieged by Daesh, such as the city of Deir ez-Zor, air drops of supplies are the only hope for those trapped. And finally, in some areas, UN aid convoys, under the Syrian Arab Red Crescent, have begun delivering some supplies to those in need, but it is nowhere near sufficient. One of two supply trucks that arrived in Darayya in early June 2016, maybe a quarter full. When the fighting came to each city, many civilians fled to the surrounding countryside to wait out the fighting. Unfortunately, you simply cannot survive off the land in a tent for 5+ years comfortably. Children need to go to school, to play, to grow and to learn. Adults need a job or at least something to do, something with stability and a steady income to provide food, clothing and shelter. Temporary interruptions of normal services won’t necessarily upset a life completely; in the United States, for example, in the event of a flood, things might shut down for a while, but within a few weeks services will be restored. Or, perhaps if you are unlucky enough to lose your home to a disaster, the Red Cross will provide you with temporary shelter and often the community comes together to help rebuild. However, after 5+ years of constant bombardment and war, the will of the Syrian people is being tested. Imagine, if you will, a civil war in your hometown. The fighters may not even be from the local area, as is the case with cities like Aleppo, yet they come to the city to make war and take their stand against the government. The government, in typical fashion, responds with heavy-handed tactics. In their eyes, if you’re a civilian living in a rebel-held area, you’re with the rebels. And if you’re with the rebels, you’re with the terrorists. Over 6 million Syrians are displaced within Syria, with another 6 million having fled the country. To put that in perspective, there were 21 million people living in Syria in 2010. Over half of the country has been displaced from their homes, in addition to the over 470,000 who have been killed, and those who have been injured are often left to die due to lack of adequate medical facilities (which are deliberately targeted, along with assassinations of doctors and nurses). Those still left in Syria have several options. They can join the military voluntarily (or the rebel groups, or Daesh for that matter) and serve basically until the war ends. They can wait to be drafted, at which point they are often told the lives of their family members depend on them following orders. Or they can flee, usually on foot. To put this journey into perspective, imagine if you will a civil war in the US. If I were to flee my family home in Oregon, I would need to essentially walk to Alaska to take the same journey (distance-wise) that the Syrian refugees are taking. I personally cannot fathom a situation where walking to Alaska would seem like the most viable, realistic, and hopeful option. Can you? Speeding into northern Aleppo along the only remaining road into or out of the city, the Castille Road. Daily airstrikes have made it one of the most dangerous stretches of roadway on the planet, with warplanes arriving out of nowhere and releasing their payload on whomever happens to be on the road at the time. After so many years of war and hardship, is it any wonder that many Syrians are looking overseas for a new home? 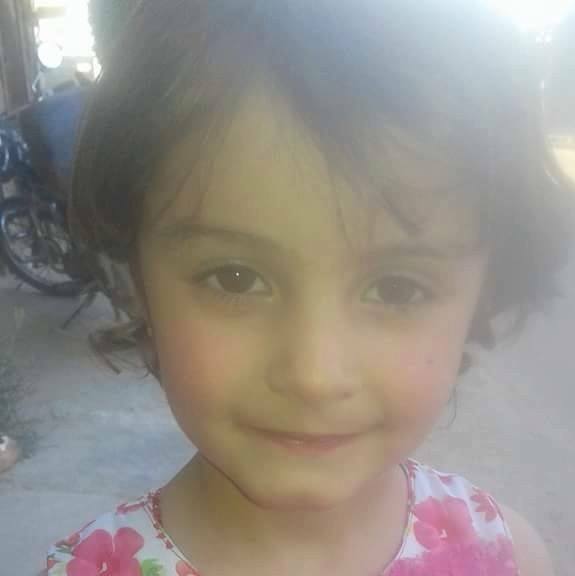 Haya Alloush, who was killed by a Syrian air strike on 20 May 2016 in her sleep at 2:00 in the morning. For whatever reason, I don’t think she would have been a threat to US national security. 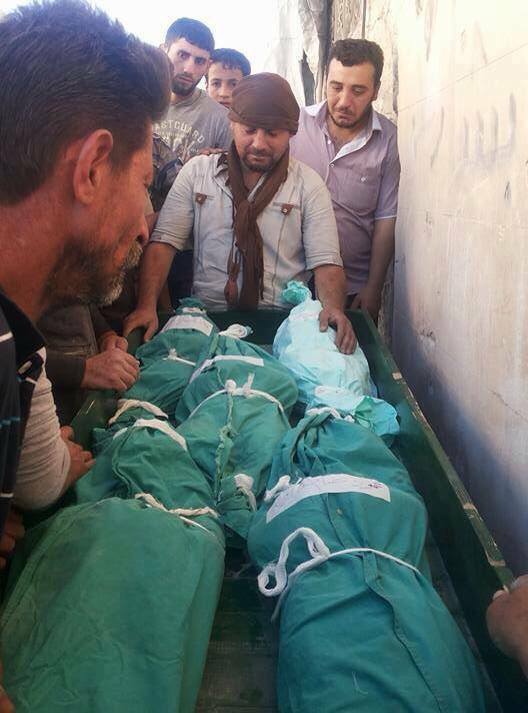 A man in Maarat Numan, Idlib Province, Syria, stands with the bodies of his five children who, along with his wife, were killed in a Syrian air force airstrike on 12 June 2016. 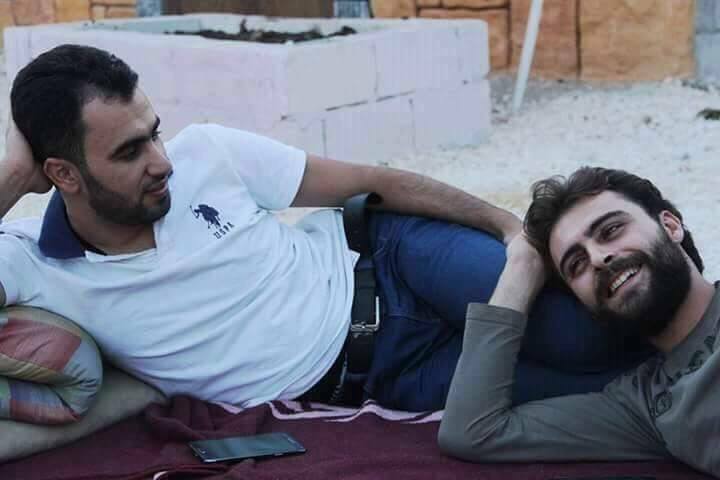 Media activist Hadi Abdullah (left) and his friend and cameraman Khaled al-Essa. Khaled was killed in June 2016 after a bomb was planted in Hadi’s front yard. Hadi is currently in Turkey receiving treatment for his injuries. Russian Air Force dropping white phosphorus on civilian areas, a war crime. White phosphorus burns anything it touches, burning through skin and down to the bone before going out. Victims are often brought to the hospital with fire and smoke coming from the holes burned in their body. The pain is excruciating and the use of WP for anything other than smoke screening or illumination in non-populated areas is prohibited by international law. The start of the refugee flow from Iraq can loosely be identified as sometime in 1991/1992. Throughout the 1990s, the United States and the United Nations enforced a strict set of sanctions on Iraq, prohibiting everything from fertilizers and baby formula to pencils, textbooks and notebooks from entering the country. Schools went without supplies, farms failed, and over 1,000,000 children starved to death. Then in March of 2003 the United States and its allies invaded to topple the government of Saddam Hussein, track down weapons of mass destruction, and bring democracy to the people of Iraq. Within days of capturing Baghdad, the United States appointed a man named Paul Bremer to the position of Administrator of the Coalition Provisional Authority (temporary leadership of Iraq). One of Bremer’s first actions was to disband the Iraqi army and prohibit any former members of the Ba’ath Party from holding significant positions of power. In a sense, this created a power vacuum whilst simultaneously throwing over 100,000 young, hungry, desperate Iraqi men onto the streets with no real hope for a future and only their guns to provide for them. When jihadists from other countries arrived to take advantage of the chaos, they often offered generous payouts to Iraqis to assist with ambushes, plant improvised explosive devices (IEDs), and generally cause havoc. American forces, often fearing for their own lives, resorted to overwhelming violence to suppress enemies, but often this meant the taking of innocent lives in the crossfire. As a result, many thousands of Iraqis began looking overseas for a new home. 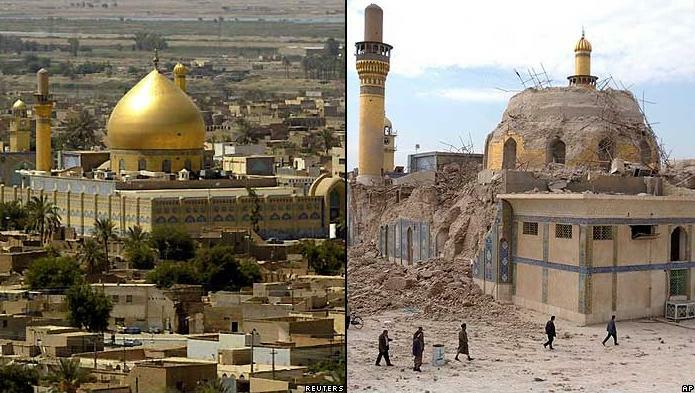 In 2006, al Qaeda in Iraq (AQI, later the Islamic State of Iraq [ISI] and eventually the Islamic State of Iraq and al-Sham [ISIS/Daesh]) blew up the al-Askari Mosque in Samarra, triggering a full-blown civil war between Sunnis and Shias in Iraq. In retribution against the minority-Sunni population for crimes committed under Saddam Hussein against Shia citizens (Hussein was a Sunni), the majority-Shia population began using its newfound political power to harass, assault, and eventually kill many thousands of innocent Sunnis. Death squads roamed the cities looking for Sunnis, and Sunni insurgent groups carried out attacks against Shia civilian areas. Al Qaeda succeeded in their mission of sparking a civil war, which would prove extremely difficult for the American forces to handle. 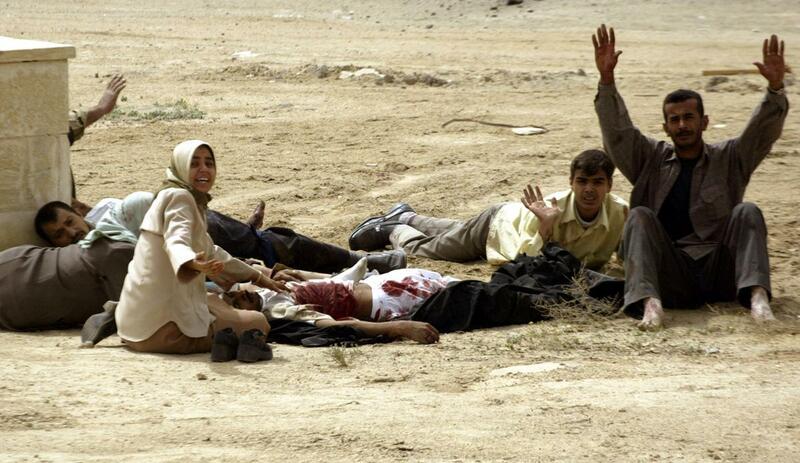 Between the invasion of Iraq and the ensuing chaos and civil war, an estimated 400,000-1,000,000 Iraqis were killed and many more wounded or displaced. Children had limbs blown off by air strikes, houses were destroyed, women sexually assaulted and men often executed or thrown in prison without reason. As a result, the outflow of refugees increased. By early 2007 over 2 million had fled the country, with the final number in 2007 resting at 40% of Iraq’s middle class population fleeing overseas to escape the violence. When Daesh captured Mosul in 2014, this stream of refugees turned into a torrent. Millions fled to Iraqi Kurdistan while others fled for Europe, often on foot. They, like their Syrian neighbors, must walk a distance essentially the same as walking across the US, from coast to coast, to escape the destruction and violence. The point of this post hasn’t been to disturb the reader, rather to paint a picture of what the refugees from just two countries are up against and what makes them want to flee. I understand fears of terrorism, but it is important to keep in mind that these are people who are fleeing the same terrorists we fear. If you were in their position, would you not also want to get the hell out of the region? Bear in mind 50% of the refugees from Syria are children under the age of 18. How can we, a nation of immigrants and refugees, turn away some of the most desperate, deprived people on the planet? 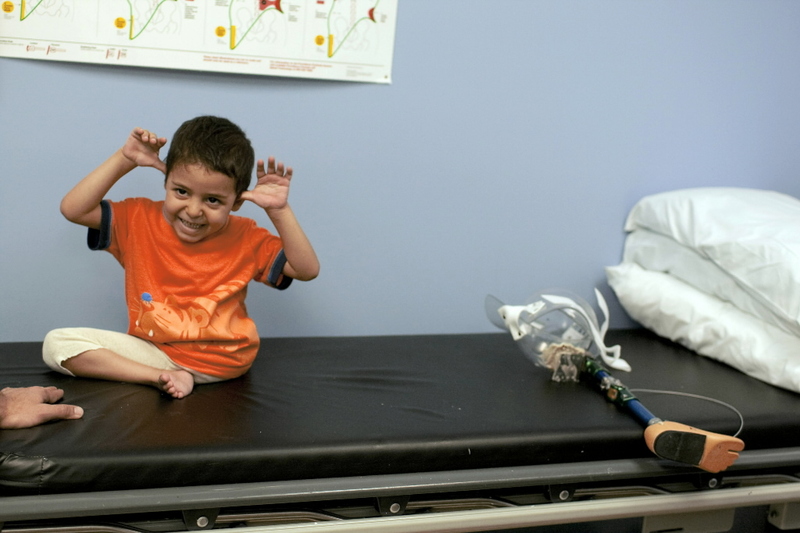 Then-6 year old Mustafa Ahmed Abed, who lost his leg in an American air strike, playing around at Portland Shriner’s Hospital in Portland, Oregon, where he was fitted with a custom prosthetic leg. Today he is 14 years old, has outgrown his leg, and sleeps on the floor in a tent outside Fallujah, which he was forced to flee due to fighting. So what can we do? The easiest and most effective way to directly improve the lives of those afflicted by the wars described above is to donate to one of several aid agencies operating in the region. 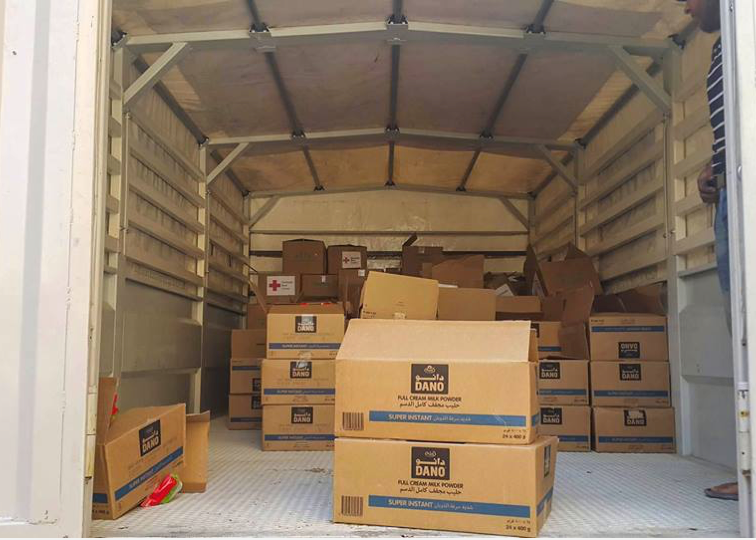 To truly alleviate the refugee crisis we must first end the wars in Syria and Iraq, but in the meantime, food, medical supplies, school supplies, and other essentials can be distributed to those in need. Karam Foundation — Set up in honor of media activist and cameraman Khaled al-Essa to benefit children in the city of Kafranbel, Syria. The White Helmets — Also known as the Syrian Civil Defense, the White Helmets are a non-aligned, unarmed group of volunteer rescue workers who run toward the bombs to save strangers and friends alike all across Syria.